In large bowl, beat softened butter and brown sugar with electric mixer on low speed until well mixed, scraping bowl occasionally. Add eggs one at a time, beating well after each addition. Reduce speed to low; beat in corn syrup, cornstarch, lemon juice and vanilla until well blended. 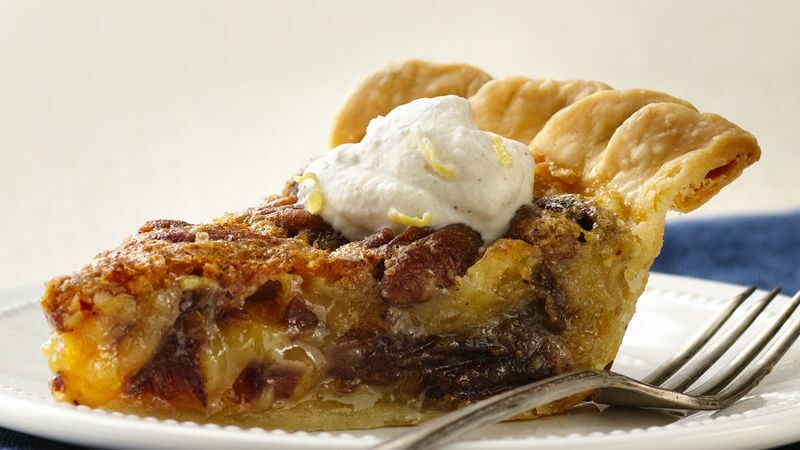 Sprinkle pecans and dates in crust; carefully pour filling mixture in crust over pecans and dates. Cover crust edge with 2- to 3-inch-wide strips of foil to prevent excessive browning; remove foil during last 15 minutes of bake time. Bake 45 to 55 minutes or until center is set. Cool on cooling rack at least 2 hours before serving. In chilled small bowl, beat whipping cream and cinnamon on high speed until stiff peaks form. Fold in lemon peel. Spoon dollop of topping on each serving. Garnish the dollop of topping with a wedge from a lemon slice or a curl of lemon rind. Packaged chopped dates are not recommended for this recipe. They are coated with sugar. To ease the chopping of moist, sticky whole dates, spray the knife with cooking spray.